Selecting fonts might seem like one of the easiest tasks of designing. However, the text on a brochure or business card can make or break the success of the overall design. That’s because fonts have the power to influence your overall perception of text. For example, a recent study gave pregnant women a sheet of paper detailing the same at-home exercises, but with different fonts. The pregnant women who had the instructions with harder-to-read fonts felt like the activities were more difficult to complete. Fonts also tap into your semantic memory. Certain fonts are ingrained in your mind as being associated with something. When you see that font, you think of that thing. For example, Helvetica is a font used on U.S. government tax forms, but also in the New York City transportation system (I.E., all NYC subways signs). 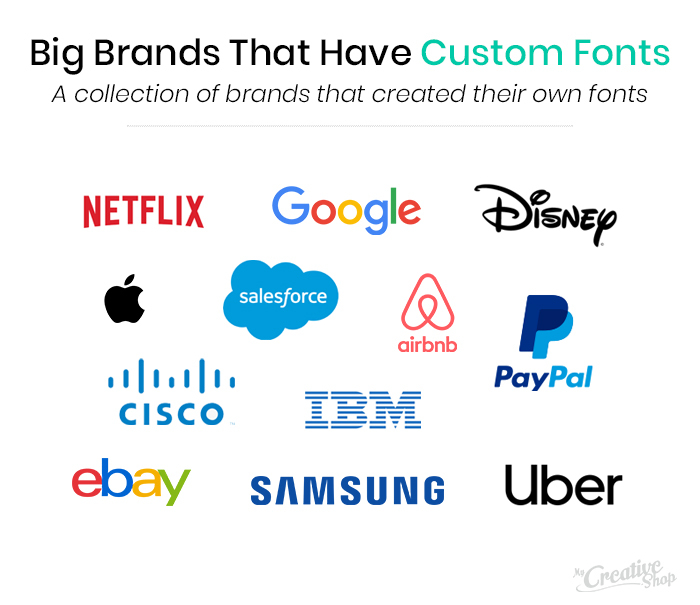 This is why large brands often create their own font. A common example, is the eponymous Disney font, Waltograph. Netflix also recently created its own font to further differentiate its branding. Serif: Small embellishments at the end of each letter. Sans Serif: The word “sans” is means “without”—as such, san serif is the serif font with no embellishments, which creates a cleaner effect. Script: Mimics handwriting or cursive. Decorative: Any non-traditional font with an element of design or artwork. If you’re feeling a little lost, you’re not alone. 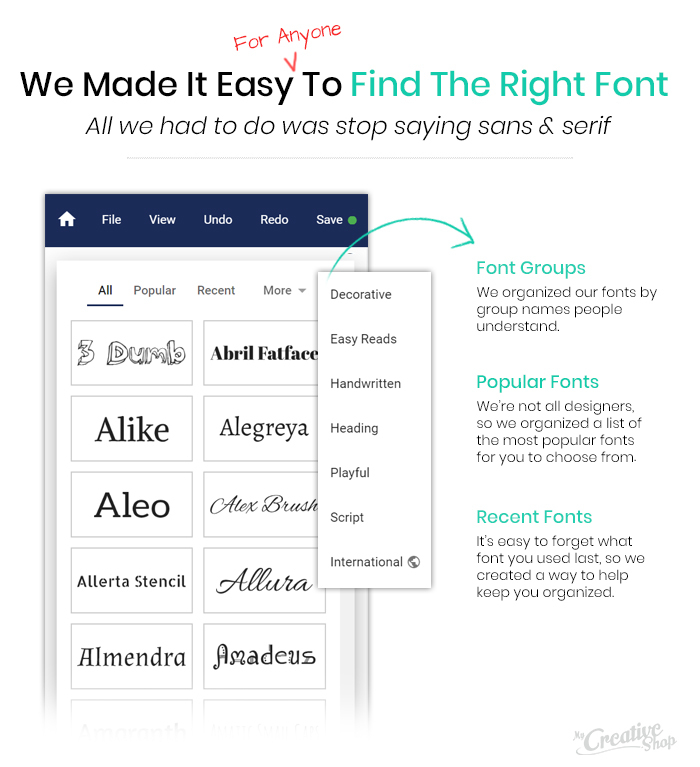 We noticed that MyCreativeShop users were having a hard time finding the right font, so we decided to build a font list that’s clearly organized and easy to use. We use group labels to make sense of these categories and the various font types, so designing is even easier for you. If you’re ready to explore some fonts before designing, check out the following font examples and consider how they can work in your business’s designs. Use cabin for paragraph copy on a flyer or brochure because it’s easy to read in large blocks of text thanks to the clean finish. This font evokes writing with a thick-tipped Sharpie. It’s eye-catching and works well for a bold title or header. Think of a fashion or beauty blog. Pair Permanent Marker with a minimalistic san-serif font, like Rambla. This is a header or title font. It’s modern and crisp design is popular with graphic designers. Raleway as a header works well with Roboto as your main copy font. Merriweather is a classic trendy and simplistic serif font that works especially well on screen. If you’re designing any graphics for social media or website, consider using it. In particular, the all-caps format stands out to make an impact. This font is unicase design (either all upper or all lower, not a combination of the two) and gives a modern and fresh feel to your design. While it reads well as copy text, it can also be used as the font for a single-word logo with graphic elements around it. While this italic-script font looks handwritten, it still comes across clean and concise. Courgette offers a lightness to any text, without being a hard-to-understand cursive or brush font. Use anywhere that you want a font with a balanced flow that stands out—not recommended for body copy or long text. If you’re looking for a font that creates a sense of nostalgia, use this one. Fascinate is a decorative font, specifically in the Art Deco style (similar to Broadway on the original Microsoft word programs). This font works well if you’re marketing a flashback or historical-type event; think a Great Gatsby party. Another brushy, hand-drawn font, Desyrel looks slightly more unique, as if an eccentric, creative person with quirky handwriting quickly sketched it. If you want a bold CTA or proclamation, Desyrel is a winner. For a subtext, Exo contrasts well. This sans-serif font is versatile. It reads well on screen and print, so can be used for headlines or main text. As the name applies, it’s a narrow font, so if you’re short on room (say on a business card), this is a good option—you can fit in more text without it looking too cramped. Another multifaceted font, Lustria is a refined serif font, that works with body text. However, its subtle yet stylized serifs also create an elegant feel when used in large-sized format. Ty combining Lustria with Lato; the two fonts look similar, but they’re slight differences complement one another. Fonts elicit feelings. When creating your own marketing materials, think carefully about the tone you want to portray and how your fonts can bring that to your design. The right fonts will make for an effective and eye-catching design and reinforce your message. Dustin is the lead designer and co-owner of MyCreativeShop. He focuses on content creation, analytics, user experience & all things designers do. Additionally, he shares in the responsibility of doing whatever else the business needs.